Read all the current and previous issues of Momentum Magazine from the comfort of your tablet or smartphone! Subscribe and gain some marketing MOMENTUM with our complimentary publication. 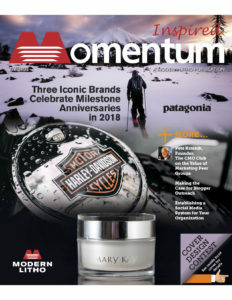 Created with print and marketing professionals in mind, INSPIRED MOMENTUM offers a wide range of articles focusing on the hottest trends in the industry including marketing intelligence, trends, data and best practices. It’s time to gain some marketing INSPIRED MOMENTUM and Modern Litho is delivering the perfect tool to help you get started! Subscribe to INSPIRED MOMENTUM today. It’s FREE and easy to do!